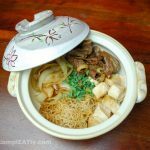 This is one of my favorite comfort dishes from Japan. 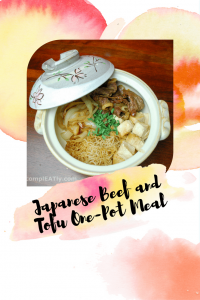 The light flavors of the sauce blend beautifully with the beef, tofu, onion and shirataki, creating a wholesome one-pot meal. Keeping the different components of the dish means that they each maintain their own flavor, and guests can choose the portions of each dish they want. Dieters can load up on zero-calorie shirataki while still enjoying the flavors of the dish. Rinse the shirataki noodles in cold water, and add to a small pot of water at a rolling boil. Let the noodles boil for 2-3 minutes, before draining and setting aside. Cut the block of tofu into 1 inch cubes. Slice the onion using the Frenched onion technique, or the wedge-cut technique. Mix together the water, sugar, mirin, sake, and soy sauce. Heat the oil in a pot. Brown the beef in the oil, then push the meat to one quadrant of the pot. Add the onions to the pot, and gently toss until coated in oil. Push the onions to a second quadrant of the pot. Add the tofu to the third quadrant of the pot (gently toss to coat in oil). Add the shirataki to the last quadrant of the pot (gently toss to coat in oil). Pour the sauce mixture over the ingredients, and let the dish simmer until all the liquid has evaporated. Garnish with green onions or garlic chives, and enjoy.